Develop a library staff training program that really works! To stay on top of the lightning-fast changes in the library field and provide your patrons with the best service possible, you need to establish and sustain an effective program for training your staff. 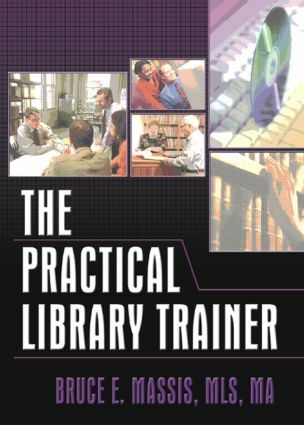 The Practical Library Trainer examines the concept of the library as a learning place for patrons and staff, offering a comprehensive view of training from an administrator’s perspective. Bruce E. Massis, author of The Practical Library Manager (Haworth), addresses the essential issues of how to develop a strong program of continuous instruction, including customer service, reporting, recruitment, and retention of staff. The book focuses on the integration of staff training as a blended activity instead of an intervention, quelling the notion of training as an add-on to existing staff duties. The current information-rich environment provides your patrons with an abundance of resources to choose from for their research needs. But they can’t do it alone-they need direction from a knowledgeable librarian who can recognize the pedigree, currency, and validity of licensed resources, particularly those available through electronic means. The Practical Library Trainer uses the goal of long-range customer service as a starting point, emphasizing the return on investment possibilities from blended training methods as a key to meeting your patrons’ high expectations of service. The book also provides examples from outside the library community to demonstrate the importance of training on a non-library setting and looks at future training issues. The Practical Library Trainer is an important resource for making sure your patrons get the most from your libraryand your staff. Chapter 2. Recruitment and Retention of Library Staff: Can These Issues Benefit from a Staff Training Program?